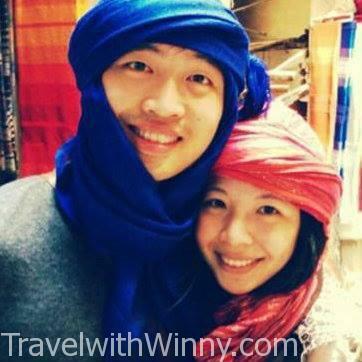 The Fake Uluru & The Real Uluru Sunset - Travel with Winny The whole process was like a war, since we really want to catch a glimpse of the post card Uluru Sunset. There were a lot of people standing there waiting already, with champagnes and crackers, even though we did not have champagnes, we did have beer in hand to pose with the famous the Uluru sunset. Uluru looked quite small from the observation deck; one American girl said even said she was disappointed because it looked different to the post card. Leith promised us that the place we are going to tomorrow will be a lot better and bigger. After whole day of sitting in the car, at 4.40pm we arrived at our final resting station. 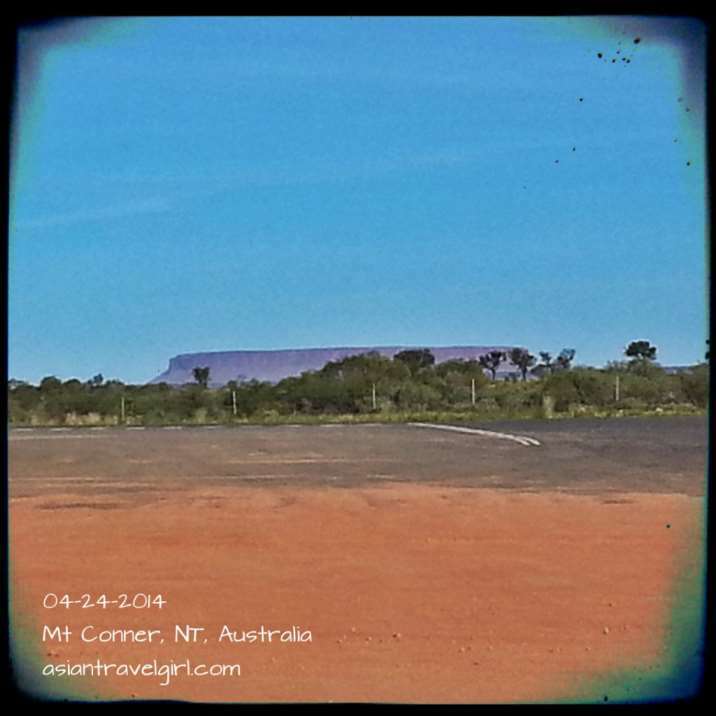 We saw a massive mass in the distance that looked like Uluru. All of us got super excited and started snapping away. Leigh yelled to us saying that is Mt Conner, aka, “Fool-uru”. It may look like Uluru from one angle, but it is not. 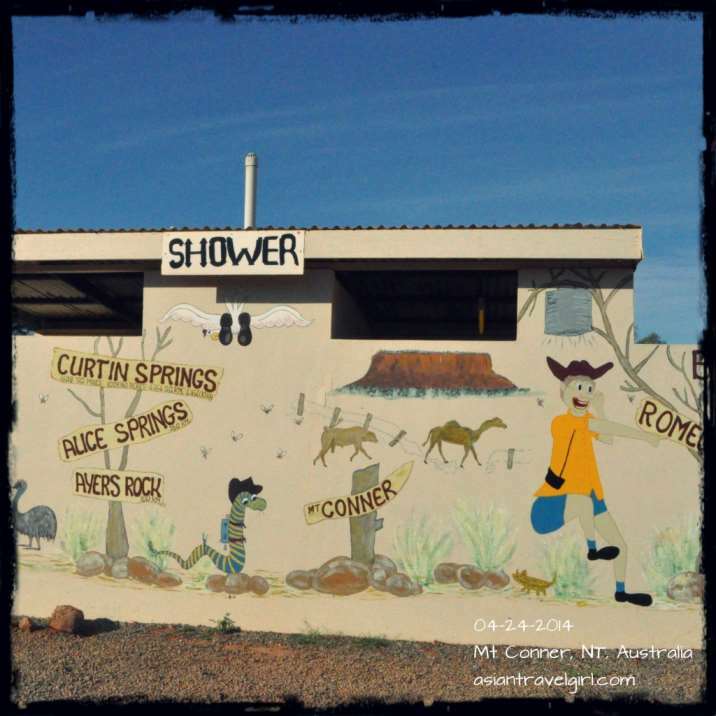 We didn’t believe him until we saw some random paintings outside the toilet walls with bald writing that says “Mt Conner”. Leith further explained to us that Mt Conner was not considered as holy because the amount of salt lakes near the foot of the mountain, therefore there weren’t much life going on around the area. The Aboriginals believes that if there were no signs of life around the area, the place itself is not sacred. 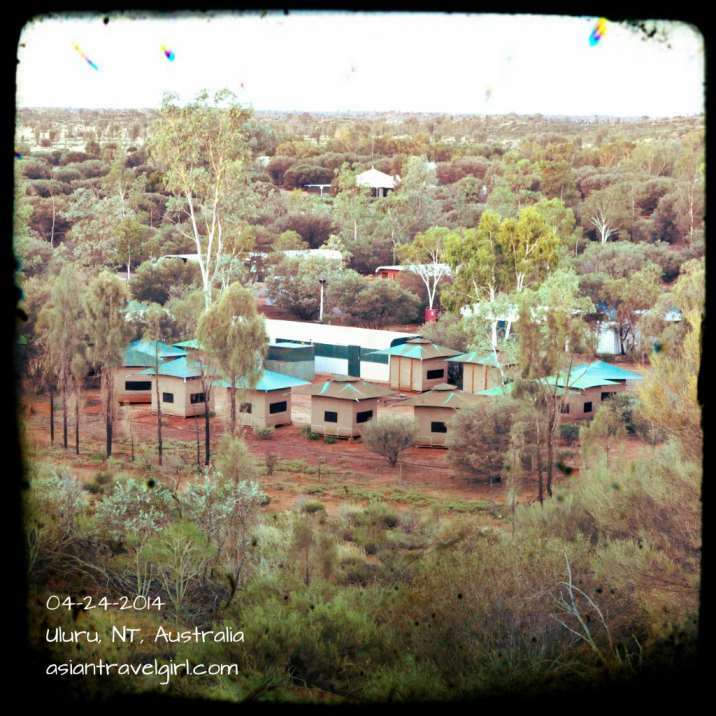 He told us not to be disappointed; the real Uluru is only 50 minute drive away from here. A bit of Australian humor…. At 5.45pm we reached our campsite, the campsite tonight has really good signals, even Vodafone has signals! We unloaded our bags quickly and went to an observation area near our camp site which was 5 minutes away. 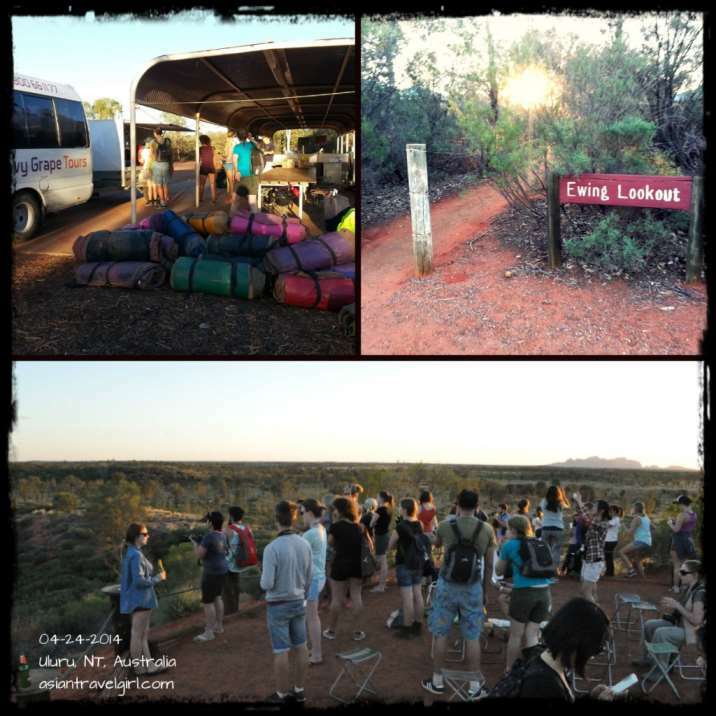 The whole process was like a war, since we really want to catch a glimpse of the post card Uluru Sunset. 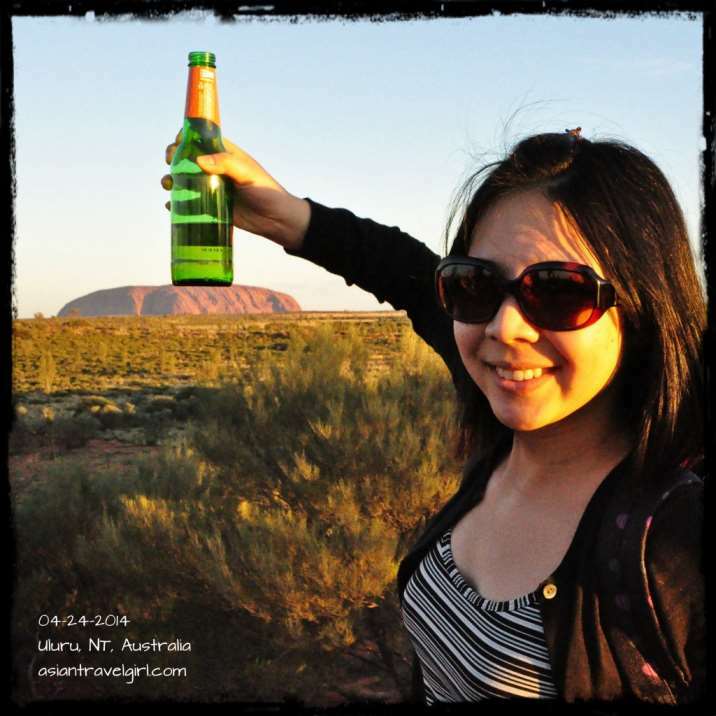 There were a lot of people standing there waiting already, with champagnes and crackers, even though we did not have champagnes, we did have beer in hand to pose with the famous the Uluru sunset. Uluru looked quite small from the observation deck; one American girl said even said she was disappointed because it looked different to the post card. Leith promised us that the place we are going to tomorrow will be a lot better and bigger. The campsite itself is quite pleasant; there were lots of toilet and showers. 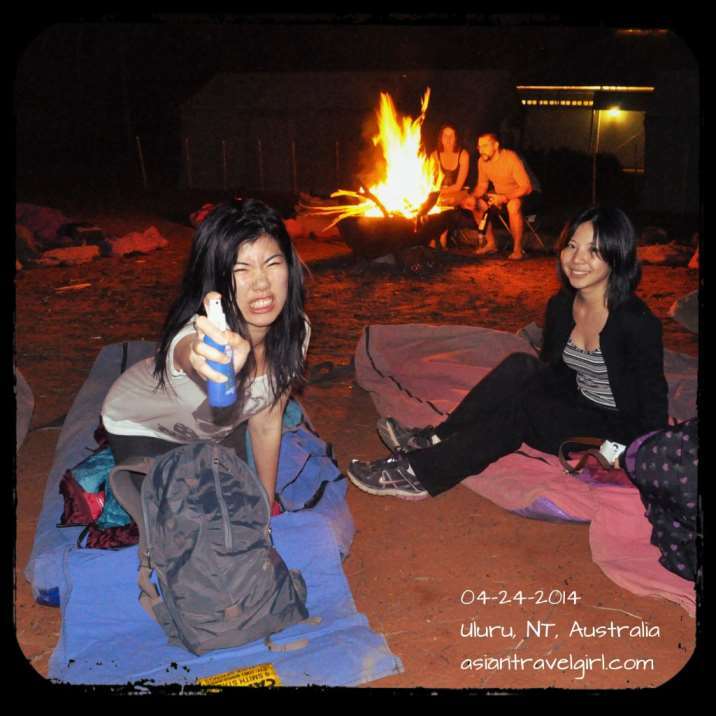 I guess that is because everyone that visited Uluru will be camping at the same spot. Some other tours gets to sleep in cabins, we get what we paid for and sleep on the ground in swags. I think our way is better since we get to experience the real Australia. I was very lucky that I showered quite early, when I went to the toilet later at night, it was flooded with girls trying to gain a bit of space in front of the mirror to remove their makeups. Some sections were even flooded. Finally after everything has been done, Leith the chef solely cooked for us. I was so hungry I walked up to Leith and asked him to give me the largest kangaroo steak. The kangaroo steak was delicious! Many people were afraid of the taste, however I found it very enjoyable, was perfectly cooked in medium-rare state. 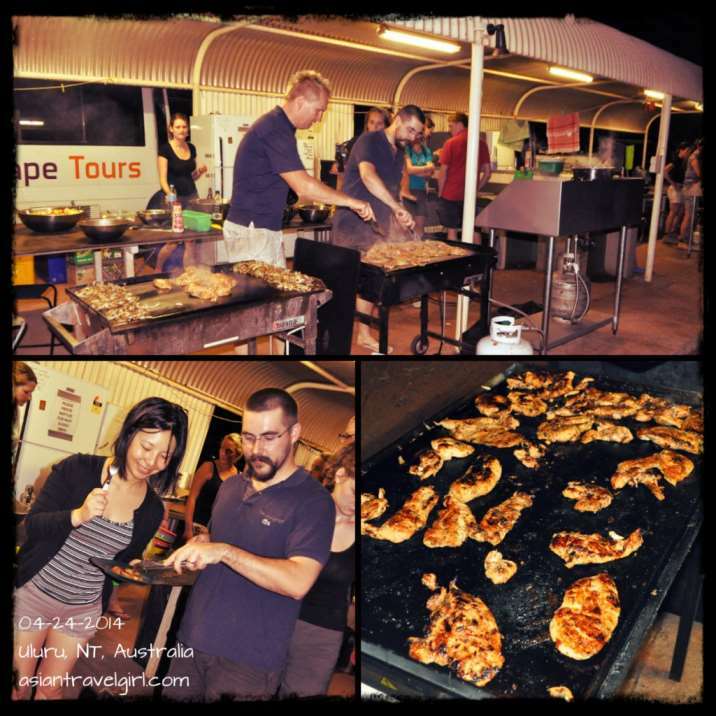 People who are not fond of kangaroo meat were given a choice of chicken instead. I love kangaroo so much I even had seconds. Leith definitely did a great job marinating the meat in the wild. I asked him if he was always this good, he said he had to learn along the way and figure out a recipe. The backpackers are usually honest people who can give honest opinions about how the meals taste like, that is how he improves. 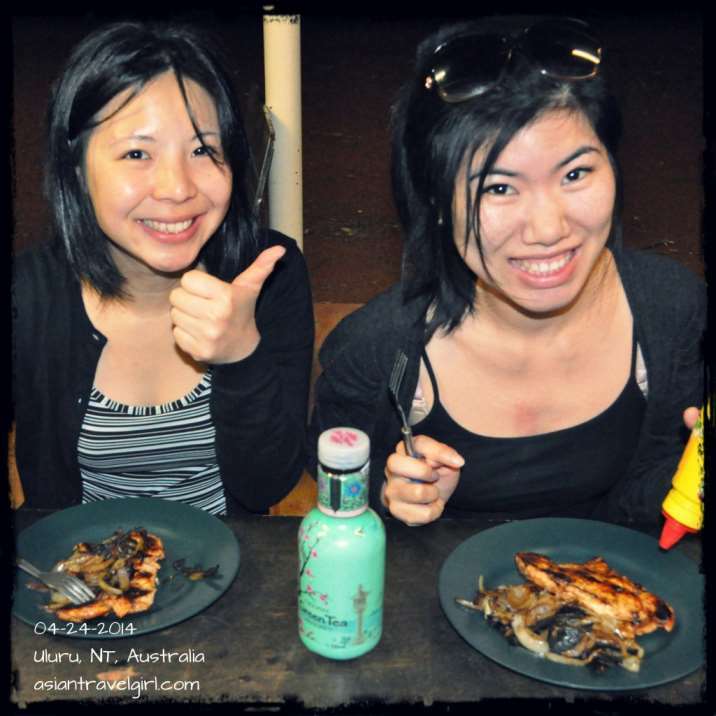 These are very well marinated and cooked kangaroo steak and chicken! Thumbs up! After dinner, everyone gathered around the bonfire and someone brought out a guitar and started singing. Everyone who knew the song would start joining. It was a beautiful night with lovely weather and camping under the stars.